Pregnancy is a beautiful phase in a woman’s life. The joy, fear, and responsibility of growing another life pose enormous pressure to eat for two. However, what is more important than eating for two is eating the right food favorable for both the mother and child. Healthy food should not just satisfy your cravings but also provided enough nutrients and protein for the unborn baby too. Hummus is a perfect pregnancy food packed with protein, calcium, folate, magnesium and iron. This article will guide you in understanding hummus and safety precautions to follow while consuming it. Hummus is primarily made of chickpea and Tahini, which in turn is made of sesame seeds, olive oil, lemon, garlic and spices. It is a rich creamy Mediterranean staple dip loaded with nutrients required for a healthy pregnancy. The combination of chickpea along with tahini makes it a super food with crucial minerals like copper, manganese, iron and zinc found in abundance in Hummus. Hummus is a calorie-rich food consisting of 200 calories, where carbohydrates account for 16 g for a serving of 100g hummus. Let the numbers not scare you as these nutrient-dense calories are predominantly good for your health and keep you satiated without increasing the blood glucose level. Is It Safe To Consume Hummus During Pregnancy? Even though hummus is slated as the superfood offering a wide range of nutrients and protein, it is best to wield caution while consuming it during pregnancy. Avoid over-consumption. Also, always make sure it is stored and packed hygienically. However, if taken in moderation hummus is both safe and beneficial during pregnancy. Folate and iron are the most important factors for a healthy pregnancy and healthy development of the baby. Did you know a quarter cup of hummus meets about more than 10 percent of the daily value for both nutrients? What Are The Benefits Of Eating Hummus During Pregnancy? 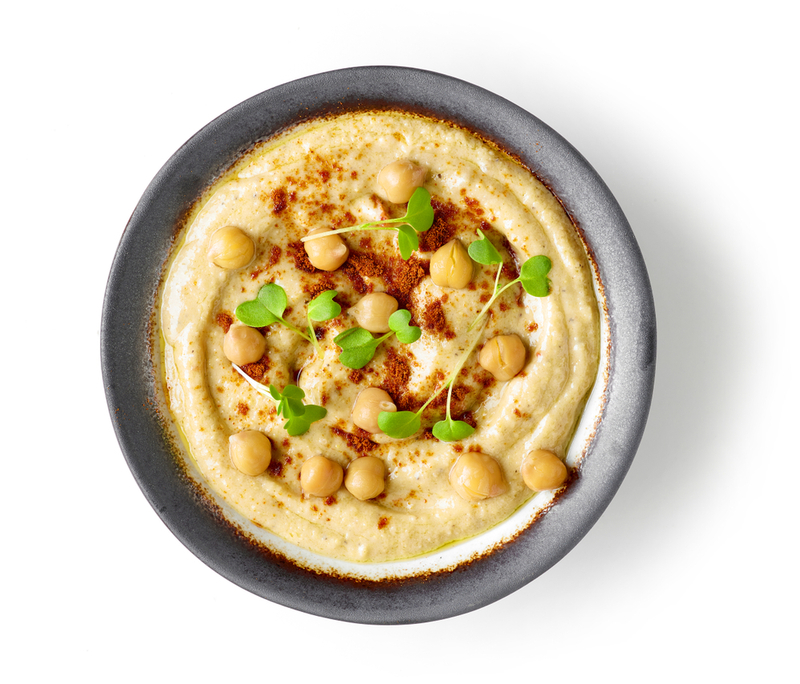 A wonderful source of Protein: Chickpea being the primary ingredient, hummus is a wonderful source of protein accounting for 8g per 100g of serving. Protein forms the building blocks of our body as well as the developing fetus. Hummus is a healthy option to increase the protein intake during the second and third trimester. Enhance Bone Development Of The Unborn Baby: The calcium in hummus helps in the strong development of the bones while the iron ensures the production of blood supply-enhancing the bone development of the fetus. Hummus offers a varied range of essential vitamins and minerals like folate, iron magnesium, copper and zinc. Reduce The Risk Of Birth Defect: The foliate present in hummus reduces the occurrence of neural tube defects closely associated with spine and brain development like spina bifida. The main ingredient that goes in the making of hummus is the tahini or sesame paste along with olive oil. It is a rich source of Omega 3 and contains 20 essential amino acids required for the development of the baby. Enhance The Development Of The Brain And Retina Of Fetus: The essential fatty acid such as Omega 3, present in hummus aids in the development of fetal brain development and retina health. It is also rich in potassium which plays a role in the brain development of the fetus. Improves Digestion: Being a good source of dietary fiber, hummus aids at keeping constipation at bay by improving digestion and gut health. The most common issues expecting mothers face is due to poor digestion. Helps To Alleviate Joint Pains: Hummus contains a significant amount of olive oil, which has a strong anti-inflammatory property. Therefore hummus during pregnancy helps to combat inflammations and joint pains. Low GI (Glycemic Index): It is highly beneficial for expecting mothers who are experiencing gestational diabetes. They can get all the nutritional benefits of hummus without raising the blood sugar level because of its low GI. Great For Expecting Mothers With Intolerances: Hummus is free from gluten-, nut- and dairy. Therefore, it is a great choice for expecting mothers experiencing celiac disease, nut allergies and lactose intolerance. Enough said about the benefits of hummus during pregnancy. What we need to consider is the concern surrounding the superfood plagued by listeria. Listeria or Listeriosis is a foodborne disease which is the main cause of concern during pregnancy. It affects the immune system of the pregnant women and poses a great risk to the unborn fetus. If left unnoticed, it could prove fatal to the unborn child leading to miscarriage or premature delivery. Keep an eye out for symptoms of listeria like fever, rashes and the common cold. If you experience any of the above after consuming hummus or suspect that you might have come in contact with listeria-contaminated food, consult your doctor immediately. It is advisable to consume freshly prepared hummus. In case of consuming store-bought hummus, make sure to store it properly in the refrigerator and once opened it is better to consume within 48hrs. Always look for foul smell and appearance. If it looks suspicious, it is better to discard than be sorry. How To Prepare Hummus In Home? Soak the chickpeas overnight with water. Boil the chickpeas till it is done. Let cool and grind it along with the other ingredients to a smooth paste. Enjoy the freshly prepared hummus as a sandwich spread or veggie dip. Hummus is indeed a superfood when consumed in moderation and keeping the safety standards in mind. Throughout pregnancy, the expectant mother should aim at maintaining a balanced diet and include all food groups in moderation. Previous ArticleIs Dragon Fruit Safe During Pregnancy? Next Article Can Pregnant Women Eat Smoked Ribs?